Which is worse, to be a legalist or an antinomian? Do we just have to pick our poison? Using the Marrow Controversy of the 18th Century as inspiration, Ferguson shows just how dangerous such a question can be. Praised as one of the most important Christian publications of our time, this perspective-changing bundle calls the church to recognize the pure gospel as the only cure to either error. The Whole Christ—Since the days of the early church, Christians have wrestled with the relationship between the law and gospel. If, as the apostle Paul says, salvation is by grace and the law cannot save, what relevance does the law have for Christians today? 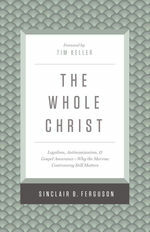 The Whole Christ DVD—Why do we need the law if salvation is by grace alone? Dr. Sinclair B. Ferguson answers this important question and explains its relevance today by revisiting the Marrow Controversy--an eighteenth-century debate over the relationship between God's grace and our works. Dr. Ferguson explains that the solution to both legalism and lawlessness is the gospel of Jesus Christ. Standard-definition DVD. Twelve 23-minute messages, including Spanish navigation and dubbed equivalent. The Whole Christ Study Guide—Why do we need the law if salvation is by grace alone? Dr. Sinclair B. Ferguson answers this important question and explains its relevance today by revisiting the Marrow Controversy--an eighteenth-century debate over the relationship between God's grace and our works. Dr. Ferguson explains that the solution to both legalism and lawlessness is the gospel of Jesus Christ. The Marrow of Modern Divinity—An intriguing book, quite unlike any other The Marrow of Modern Divinity defies pigeonholing. It was written in the 1600s by an author of whom we know little, yet it proved to be a critically important and controversial theological text.